The Rho proteins play critical roles in numerous aspects of neuronal development, and mutations in their regulators (GEFs and GAPs) and effectors underlie multiple neurodevelopmental and neurological disorders. How Rho GTPase-mediated signaling can have a hand in regulating so many different neurobiological processes remains a challenging question. 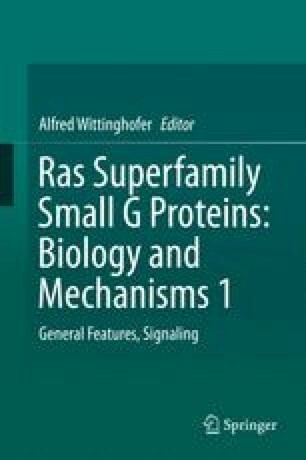 An emerging theme is that GAPs and GEFs, through their spatial/temporal regulation and/or through additional protein–protein interactions, cooperate in making connections between upstream signals and the downstream signaling output, engaging distinct effector proteins. This chapter focuses on recent evidence illustrating distinct modes of regulation and specialized roles of Rho regulators particularly in the context of synaptic structure, function, and plasticity, and how their dysregulation affects behavioral processes and contributes to disease. We thank Jim Duffy for his help with the graphic art of Fig. 17.1. We apologize to colleagues we did not cite due to space limitations. L.V.A. is supported by grants from the NIH (R01 MH082808 and R01 NS082266) and S.H.S by NIH (2R56NS059957-06). The authors declare that they have no conflict of interest and that there are no competing financial interests.